capacity building and mutual learning in conducting technically-robust education policy research for government officials and researchers in the Asia-Pacific region. The Knowledge Generation and Dissemination to Support Policy Reform in Member States project is being implemented through UNESCO Bangkok’s existing networks, i.e. Asia-Pacific Education Research Institutes Network (ERI-Net) and the Network on Education Quality Monitoring in the Asia Pacific (NEQMAP). The success of this project also relies on the close cooperation with various international partners, generous funding and technical support from the Malaysia Funds-in-Trust, Tokyo Institute of Technology, Kobe University, Zhejiang University and Korean Education Development Institute (KEDI). Through the project, UNESCO had successfully organized 3 regional studies expert meeting focusing on key issues particularly on the integration of transversal competencies; utilization of assessment data for policy making and school finance. One of which is the 2015 ERI-Net Expert Meeting for School Education Group (Phase III Study on Integrating Transversal Skills in Policies and Practice: How Teachers Could Better Respond to and Prepare for the Globalization of Education). Launched a regional programme called “Learning Enablers for Asia and Pacific” (LEAP) which specifically focuses on 1) mapping of national practices of collecting, analyzing and utilizing international and national assessment data for policy formulation and implementation, 2) conducting analysis of large scale international and national assessments to identity learning enablers and 3) organizing technical workshops to enhance institutional and human capacity in the area of data analysis and policy design. Developed UNESCO’s online knowledge portal on education policies (National Education Systems and Policies in Asia-Pacific, NESPAP). Policy makers and researchers across the Asia Pacific region have greatly benefitted especially on the latest discussions of education policies as well as best practices. The NESPAP platform (www.unescobkk.org/nespap) is maintained by UNESCO Bangkok. Establishment of an information base on Quality Assurance of TVET Qualifications in Asia-Pacific and support to the establishment of the ASEAN Qualifications Reference Framework. The project is expected to contribute to the increased relevance of TVET systems and stronger alignment of learning outcomes in TVET with labour market needs of Member States in Asia-Pacific. Publication: Review of the Pacific Framework for Technical and Vocational Education and Training (2012-2015). The Review was conducted in collaboration with the Secretariat of the Pacific Community. The Review findings were discussed at the 21st consultation meeting of the Pacific Heads of Education Systems (PHES) in Port Vila, Vanuatu, on 20-21 October 2015. The observations and recommendations from this Review are expected to inform the formulation of the new Pacific Education Development Framework (PEDF), especially the PEDF TVET outcome, in the upcoming Forum Education Ministers Meeting (FEdMM) in May 2018. It will be submitted for endorsement and as the basis for agreement on the revision of the regional framework for TVET in the Pacific. Publication: Transversal Skills in TVET: Pedagogies and Assessment. The synthesis report of the 2nd phase of UNESCO Bangkok’s research study on transversal competencies was published in November 2015, and has been/will be shared widely with stakeholders at (upcoming) regional meetings and conferences on TVET (SEAMEO VOCTECH, OECD-GIZ Policy Forum, RECOTVET Regional Policy Dialogue, etc.) The report looks at experiences of teaching and assessing transversal skills in TVET in three countries, namely, Brunei, Thailand and the Republic of Korea. Establishment of an Information Base on Quality Assurance of TVET in Asia Pacific. This activity was conducted through a 3-phased approach. In Phase 1, the project has produced a discussion paper which explores and identifies issues involved in assuring quality and consistency of qualification process. In Phase 2, country reports were produced and synthesis report was developed. As part of the Phase 3 of this project, the regional guidelines for QA of TVET qualifications were developed and disseminated. It was presented and endorsed at the 3rd High Officials Meeting on SEA-TVET that gathered approximately 180 delegates from the Ministries of Education and related Ministries from 9 SEA countries, institutions and regional agencies, representatives Japan and Germany amongst others. The publications on the Pacific TVET framework (400 copies printed) and transversal skills in TVET (500 copies produced) have been shared through the UNESCO-UNEVOC e-forum, a global platform of TVET practitioners and stakeholders, and the Member states through UNESCO field offices and with UNESCO’s TVET partners, including GIZ, TVET@Asia, the Regional Association for Vocational Teacher Education in East and Southeast Asia (RAVTE), and the Asian Development Bank. For the implementation of the activities of the project “Improving the Quality of Learning through Enhanced Student Learning Assessment”, UNESCO Bangkok leverages the Network on Education Quality Monitoring in the Asia Pacific (NEQMAP). With an overall aim to improve the quality of learning in the Asia Pacific region, NEQMAP was established by UNESCO Bangkok in 2013 as a regional platform to facilitate networking, information sharing and collaborative work in support of better articulation between assessment, curriculum and pedagogy in countries of the region. The NEQMAP activities focus on capacity development, research and knowledge sharing among network members and other relevant stakeholders. This MFIT funded project is expected to benefit policy makers, researchers, education managers and practitioners and all other stakeholders of education policy in the AP region. Completed a systematic review on the impact of large-scale learning assessment on policy and practices in the Asia-Pacific in collaboration with Australian Council for Educational Research (ACER). This work was also translated into policy brief (http://unesdoc.unesco.org/images/0023/002354/235469e.pdf) and made publicly available. Launched the regional study on “Assessment of Transversal Competencies” with organization of orientation meeting (http://www.unescobkk.org/index.php?id=16300) for national researchers in October 2015. The study aims to explore different approaches or practices that countries/jurisdictions of the Asia-Pacific region adopt in assessing transversal competencies (21st century skills), the challenges encountered in the process, the lessons we could draw from the existing practices in the region and recommendations for future directions in this area. Synthesis report has been published online (http://www.unescobkk.org/resources/e-library/publications/article/assessment-of-transversal-competencies-policy-and-practice-in-the-asia-pacific-region/browse/1/) and will be launched this December. Launched the regional study on “School Based Assessment (SBA)” with organization of orientation meeting (http://www.unescobkk.org/education/quality-of-education/neqmap/activities-and-events/school-based-assessment-policies-and-practices-in-the-asia-pacific/) for national researchers in February 2016. This study, by focusing on several countries/jurisdictions in the Asia Pacific region as case studies, aims to look into policy environment in relation to SBA, gather information on different practices as well as its usage in improving quality of teaching and learning, identify relevant issues and challenges and provide recommendations for future directions in this area. Successfully organized two regional capacity development workshops. Established NEQMAP knowledge portal (http://nespap.unescobkk.org/neqmap/) as a part of National Education Systems and Policies in Asia- Pacific (NESPAP), open platform which was set up by UNESCO Bangkok. Since its launch in mid-2015, there has been continuous work towards enriching the content of the portal with additional resources as well as enhancing it from a visual and user-friendliness perspective. The project under the fund aims to strengthen the capacity of teacher training institutions of Asia Pacific Small Island Developing States (SIDS) to deliver Climate Change Education (CCE) for sustainable development at primary and secondary school levels. UNESCO through its Education Unit in the Jakarta Office assists five-targeted member states, Fiji, Tuvalu, Palau, Tonga and Niue, to integrate climate change in their education systems as well as provide technical guidance, training and resources. The success of this project also relies on the support and expertise from the Ministry of Education Malaysia as well as the relevant Malaysian institutions such as Climate Change Institute of Universiti Kebangsaan Malaysia (UKM) and Universiti Pendidikan Sultan Idris (UPSI). Through this project, the capacities of SIDS in the Asia Pacific is expected to be elevated whilst fostering regional and inter-regional dialogue on climate change education. Carried out a preliminary study and training on Education for Sustainable Development (ESD)/CCE in Tonga. Significant learning emerged from this study such as lack of ESD/CCE content knowledge as well as pedagogical content knowledge among teachers and staff of Ministry of Education and Training and lecturers at Tonga Institute of Education. Organized a stakeholders meeting to develop a common understanding of the current situation on needs gaps in CCE as well as discuss and share ideas on South-South Cooperation for CCE for SIDS in AP. The meeting brought together representatives from the Ministry of Education of the five-targeted countries in SIDS in AP i.e. Tonga, Fiji, Palau, Tuvalu and Niue as well as representatives from Malaysia, UNESCO Jakarta and Apia. Developed the Training Material for CCE for Asia Pacific SIDS based on the needs and gaps analysis of the five targeted SIDS. Organized and conducted a four-days Training of Trainers (TOT) in Malaysia for two Ministry of Education personnel responsible for teacher training for CCE in each of these five-targeted countries. This TOT contributed towards increasing the knowledge on climate change and pedagogical techniques to conduct follow-up training on CCE in their home countries. Organized and carried out a National Training of Teachers on CCE in Fiji in cooperation with NATCOM Fiji for key teachers responsible for CCE. This training succeeded in increasing the knowledge and pedagogical capacity for conducting participatory teaching methodology of the participating teachers in CCE. Officially launched the publication on the occasion of the 7th Education for Sustainable Development (ESD) Annual Meeting in Dili, Timor-Leste. Broaden the knowledge base on cutting-edge issues in TVET and skills development in Asia-Pacific. Organized the Asia-Pacific Conference on Education and Training (ACET) from 3 to 5 August 2015 in Kuala Lumpur, Malaysia. ACET brought together representatives of governments, development agencies, academia, the private sector, civil society as well as youth and employer organizations to discuss key issues in technical/ vocational education and training in the Asia-Pacific region. A total of 766 participants, including 47 government representatives from across the region, attended the Conference. ACET culminated in the Kuala Lumpur Declaration, a landmark outcome statement endorsed by 27 UNESCO Member State, outlining 8 action-oriented recommendations for the development of TVET, is expected to set the direction for TVET and skills development in the Asia-Pacific region. Publication: Enhancing Relevance in TVET: Review of Progress in the Asia-Pacific since 2012. The Review assesses the progress made by countries in Asia-Pacific in developing their TVET systems since the 3rd International Congress on TVET (Shanghai, 2012). It focuses on relevance of TVET, the first recommendation of the Shanghai Consensus, and is based on a survey conducted among ministries, employers and youth organisations in the Asia-Pacific region. The Review published in April 2016, provides an insight into progress made and remaining challenges in ensuring the relevance of TVET in the region. Conducted a Regional Study on Innovative ICT Pedagogies in Asia-Pacific to increase access and relevance of TVET. (It is currently undergoing final review). Organized the 1st Expert Meeting on Skills Needs and Anticipation from December 4th to 5th, 2017 in Bangkok, Thailand. A total of 47 participants attended, including government officials from Lao PDR, Mongolia, the Philippines, Sri Lanka and Thailand, country experts (i.e., researchers), IOM, USAID, the Thailand MoE’s Office of the Vocational Education Commission (OVEC) (central and provincial offices) and other TVET-related institutes and organizations. As the lead agency for Education for Sustainable Development (ESD) and with strong working relationships with some Pacific Island countries i.e. Fiji, Niue, Palau, Tonga and Tuvalu, UNESCO has been approached by these countries to provide additional follow up activities to expand and consolidate the work on ESD in the past few years. Among the areas covered included promoting transmission of national languages, traditional knowledge and intangible cultural heritage, and climate change and disaster risk reduction strategies. UNESCO Apia which serves as the Cluster Office for the Pacific States is responsible for the organization of the activities within the present project. It works closely with the National Commissions for UNESCO and Ministries of Education to implement the activities in each country. The activities implemented are in accordance with the priorities identified through workshops conducted in the targeted countries. Through the project, Education for Sustainable Development in the Pacific Island Countries, five national priority projects have been carried out based on the needs of the respective/selected Pacific Island countries. Fiji: Finalized Resource Book on Disaster Risk Reduction and Climate Change Using Traditional Knowledge by the Ministry of Education, Heritage and Arts of Fiji and its trial in Year 7-8 classes across 140 Primary Schools. The resource book is expected to assist teachers in teaching students about disaster risk reduction and climate change using local, indigenous/traditional knowledge so that they are able to respond to changes in the environment or when they are faced with natural disasters. Palau: Completion of a Palau Vocabulary and Idiom book aimed at strengthening the ability of Year 9 & 10 students to speak pure Palauan language. The development of this vocabulary book will reinforce correct use of the Palauan language. This will assist in promoting transmission of the Palauan language and sustain their national identities. Niue: Developed the Numeracy Standards in Vagahau Niuean language. The numeracy standards are currently used by teachers as a guide in the classroom. These standards are seen as a positive step towards achieving the integration of indigenous language into national curriculum which is aligned with the Niue National Strategic Plan as it identifies Niue culture (Taonga Niue) as one of the priority pillars which targets the promotion, preservation and strengthening of Niuean cultural heritage, language, value and identity. Tonga: Completed workshop to train teachers and curriculum staff on integration of ESD elements such as cultural knowledge, healthy lifestyles, sustainable livelihoods and climate change into secondary school curriculum in June 2015. The goal of the workshop was to provide secondary school curriculum writers in Tonga with a better and holistic understanding of the concept of ESD and how it could be integrated into the secondary school curriculum to improve the quality of learning as well as to support Tonga’s vision for sustainable development. Tuvalu: Completed workshop on climate change for primary and secondary school teachers in August 2015. The purpose of the workshop was to support teachers in learning how to use climate change flipcharts and materials which were developed specifically for the Tuvalu context in order to enhance awareness and knowledge on the impact of climate change. UNESCO is planning a follow up workshop, targeting the same group of teachers who attended the workshop in August 2015 while inviting a new group of teachers to be trained on how to effectively use the climate change materials in the classrooms. The project focuses on identifying and building pathways for young people to develop their values systems through both school-based and community-based (youth group) activities. It investigates the current state of values education in three pilot countries (Cambodia, Lao PDR, and the Philippines) in ASEAN and ways to improve implementation of values education through effective entry points in respective country contexts. Organized a methodological design meeting to finalize draft methodology, including interview and observation form and to discuss preliminary ideas on the best approaches/strategies when conducting a national mapping exercise. Conducted in-country visit to Cambodia, Lao PDR and Philippines in terms of formal and informal approaches to values education in both school-based and community-based programmes i.e. 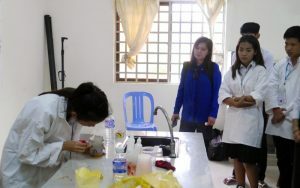 piloting the research instruments during the visit. Data gathering through the joint focus group interviews specifically provided a much broader understanding in identifying areas that need to be pursued further by the respective country consultant. Prepared interim report which illustrates the country situation, interests, recommendations as well as the analysis in terms of values integration programs and projects in the respective countries. Organized a UNESCO regional workshop to present the findings of an assessment of the state of values education in three countries – Cambodia, Lao PDR and the Philippines – a mapping exercise that is intended to inform the development of a toolkit on values education for wider dissemination. It brought together South-East Asian education ministry officials, NGO representatives as well as teachers and youth from the three target countries. The agreed targets for developing an educational toolkit in stage two were discussed during the regional workshop and a finalized proposal is included in the synthesis report submitted by the lead consultant. Discussed findings of situational analysis as well as roadmaps for in-country interventions set up at SEAMEO RECSAM, Penang, Malaysia. The workshop gathered nearly 40 experts in STEM education and related issues, policy planning, curriculum, pedagogy and teacher education from Cambodia, Cameroon, Indonesia, Kenya, Malaysia, UNESCO Bangkok Office and IBE-UNESCO. Published the 3rd issue of the IBE In-Progress Reflections series on Current and Critical issues in the Curriculum and Learning, entitled ‘Sharing Malaysian Experience in participation of Girls in STEM Education’. The document explains the successful experience of Malaysia and points outs some of its main clues and developments. This third issue is currently available in English, French and Spanish, and planned to be translated in Arabic. Coordinated national policy dialogue workshops in respective beneficiary countries (Cambodia, Kenya, Nigeria and Vietnam). Co-organized the launch event for “A Resource Pack for Gender-Responsive STEM Education” (hereinafter “the Resource Pack”) in Putrajaya, Malaysia (3-4 July) as a concluding activity of the Phase I of the project. 70 MOE Malaysian officers – curriculum developers, teacher educators and teachers – participated in the launch event followed by a two-day training on the understanding and potential use of the resource pack. IBE participated in the UNESCO International Symposium and Policy Forum Cracking the Code: Girls’ Education in STEM (28-30 August 2017) in Bangkok, facilitating a workshop session, “Using the IBE-UNESCO Gender-Responsive STEM Resource Pack to develop gender-sensitive STEM curricula”. The workshop participants (40 from 23 countries) were mainly MOE staff – policy makers and planners, curriculum developers and specialists, and educators –, researchers, university professors, UNESCO colleagues and from UN-Sister organizations, civil society and foundations. The workshop was highly appreciated by the participants, and specifically, they visualized the Resource Pack as a useful tool to support the processes of educational and curriculum reform, in-service training, teacher professional development and customized technical assistance. In addition, the Resource Pack has effectively been disseminated through the social media platforms (IBE website, Facebook and twitter). During the past 50 years South and East Asia witnessed massive demographic changes, resulting mainly from falling fertility rates and migration. Other trends impacting on the provision of education services include urbanization that has contributed to reduce densities in rural areas, thus increasing the costs of reaching the remaining rural school age population. Counterbalancing these trends have been the massive increases in participation in schooling, most countries in the region achieving universal basic education. While the education sector has been relatively well served in terms of resource allocation in past decades changes in the populations’ age structure across the region as well as a slowing global economy are likely to contribute to changes in resource allocations. Education may not be treated as generously in the future. At the same time it is important to recognize the institutional challenges associated with reorganizing education service provision. The redeployment of education personnel for example is an issue likely to yield high political costs for any government, and school closures remain difficult as local schools are seen by rural communities as a core component for a viable community life. For these reasons it is vital for education policy makers and planners to understand the directions and assess the impact of demographic changes, migration and urbanization in their country. This assessment underpins the planning of future education services and resource allocation decisions. The Malaysian Government-UNESCO/IIEP project aims at providing Ministries of Education with an analytical framework and an information base needed to reflect these crucial dimensions in plans and guide education policy, investment decisions and institutional reforms. Produced and completed methodological framework for country-based policy research and data collection. Organized technical workshop, in Delhi on 22-23 April 2016, to discuss and come to consensus the agreed research methodology to case countries and concretely plan the country-based research. Organized a second technical workshop at IIEP in Paris from 2-4 November 2016. The three country profiles were reviewed; key education policy and resource management issues identified, focusing on a comparison across countries, also discussed structure for a publication of country case studies. Organized the ANTRIEP Policy seminar in Malaysia from 2 – 5 May 2017. The regional seminar provided an opportunity to compare country experiences; and to make the project known widely among the community of specialized research and training institutions in Asia as well as Ministries of Education. Conceptualized dedicated web portal to disseminate research and information related to the research topic. Publication undergoing final process and will be ready by March 2018 for dissemination. The dedicated webpage will be launched at the same time. The Royal Government of Bhutan continuously embarked upon numerous initiatives and reforms to improve the teacher quality and create high performing schools. However, due to rise in expectations as well as the general concerns regarding the system’s ability to adequately prepare the young Bhutanese for the challenges ahead, the education system has not only come under increased public scrutiny and debate but also come to acknowledge that there exists a real concern about the overall quality of education system. Given the nature of the education system and its complexity as a public sector undertaking with multifaceted stakeholders, unless an ambitious and practical yet far-reaching corrective approach is urgently put in place, it is going to take several years, if not decades, for fundamental changes to be felt. It is only through continuous education reforms to improve quality and relevance of learning that national challenges like youth unemployment and economic development can be addressed effectively both in the medium and long-term period. The comprehensive review will provide critical and insightful elements to prepare a time bound Blueprint for a rapid and systematic reform of the education system of the country is expected to further boost the education system improvement. UNESCO co-organized two sub-regional workshop on ECCE teacher development 1) in the Pacific in Nadi, Fiji from 20 to 22 June 2017 and 2) in Southeast Asia in Bangkok from 7 to 9 August 2017. The purpose of these workshops were to share findings and recommendations of the baseline study (which was conducted by SEAMEO INNOTECH); shared countries’ policies and practices, challenges, opportunities and needs related to ECCE teachers and their support systems; as well as to review and revise the first draft of the ECCE teacher competency framework. Based on the comments received during the two sub-regional workshops, UNESCO Bangkok decided to develop two separate frameworks for SEA and the Pacific SIDS. The revised competency framework for SEA was presented and endorsed at the 40th SEAMEO High Officials Meeting (Nov 2017) for the approval of the SEAMEO Council. The revised competency framework for the Pacific SIDS was also presented and endorsed at the 22nd consultation meeting of the Pacific Heads of Education Systems (Oct 2017) for the approval of the Forum Education Ministers’ Meeting (FEdMM) 2018. The ECCE Teacher Competency Framework will be presented at the 3rd Asia-Pacific Regional Policy Forum on ECCE and regional Early Childhood Development (ECD) conference in Kathmandu, Nepal from 5 to 6 June 2018 as a reference material for the Ministerial discussion. Through South-South cooperation, and in collaboration with the Secretariat of the Pacific Community, the project will support capacity building for quality assurance of lifelong learning in Pacific Small Island Developing States (SIDS). The project addresses a pressing need in the Pacific Community to improve the responsiveness and quality assurance mechanisms of lifelong learning. While learning outcomes in connection with National Qualifications Frameworks (NQF) have been developed in recent years, capacity for implementation and monitoring is lacking in these Pacific SIDS. Through training a pool of experts on quality audits in tertiary education, including TVET and higher education, the project will build capacity to promote and effectively monitor quality lifelong learning throughout the Pacific Community. Overall the project will result in increased capacity of Pacific island countries to implement the Education 2030 sustainable development agenda (i.e. Targets 4.3 and 4.4). Organized the Pacific Capacity Building Workshop on Implementing National Qualifications Frameworks (NQF) at Programme Level: The Use of Learning Outcomes Matched Against Level Descriptors of NQFs, 20-24 March 2017, Apia, Samoa. Over 20 participants from 13 Pacific SIDS participated in the workshop. The interactive workshop covered substantive challenges in line with Education 2030 and used an innovative meeting format called “Open Space”, where participants developed and led thematic workshop sessions. In 2015, the international community adopted an ambitious set of SDGs, including one for education (SDG4), calling more equitable, inclusive, and quality lifelong learning for all. In order for countries to achieve this target, major changes will be needed in how education is planned. This project aims to build the Member States’ capacity to develop and implement evidence-based and result-oriented education sector plans to meet the challenges of SDG4 through mutual learning and South-South cooperation. Specifically, the project aims to encourage countries to learn from Malaysia’s experiences of the Education Blueprint, while enhancing sub-regional coordination mechanisms. Organized the UNESCO-SEAMEO Asia-Pacific Regional Seminar on Subregional Cooperation for Achieving SDG 4, 29-31 May, Bangkok, Thailand. The Seminar gathered 37 participants from 6 SAARC countries (Bhutan, Nepal, Bangladesh, Maldives, Pakistan, Sri Lanka), sub-regional bodies (SEAMEO, SAARC, ASEAN and Pacific Islands Forum -PIFS), and partners (UNESCO, UNICEF and SEAMEO Secretariat). Common points of actions among SAARC countries had been identified and discussions on possible partnerships between and among SAARC countries and sub-regional bodies have been initiated. Organized Technical Capacity Development Workshop on Effective Planning of Education Sector for Achieving SDG 4 on 24-28 July in KL, Malaysia. The Technical Workshop gathered 65 government officials from 17 countries (including Gambia), including UNESCO and UNICEF FOs staff. As a follow-up to the KL workshop, in-country technical support will be provided to at least 4 countries (Bhutan, Lao PDR, Cambodia and Viet Nam).